We are excited to be participating in Tinkerlab’s Egg Carton Challenge this week! The goal of the Creative Challenge was to create something using an egg carton that is child-centered/child-directed. My son loves games, especially ones that involve throwing or bowling. For the last creative challenge (with paper bags), we created our own Paper Bag Angry Birds game. 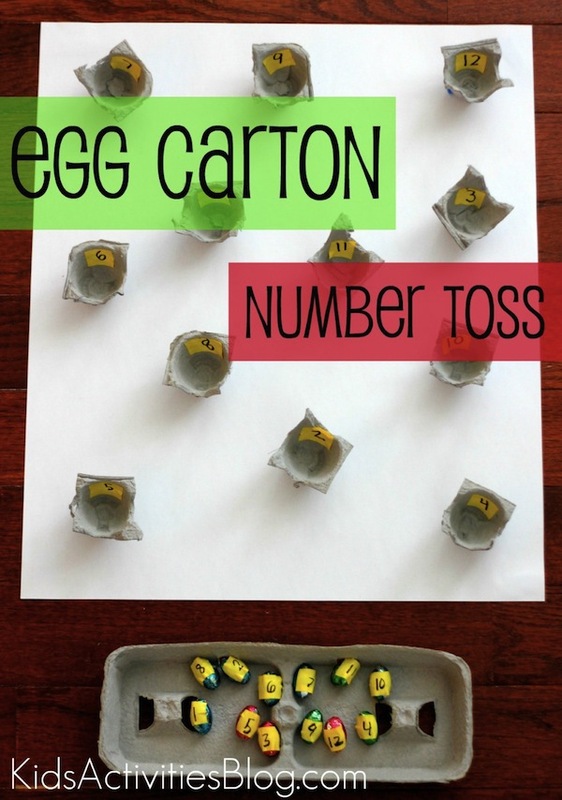 This time he decided he wanted to do something with our leftover Easter candy and throwing… so we came up with this egg carton number toss game. Cut the egg carton into twelve little pieces. Tape egg carton pieces to large drawing paper. 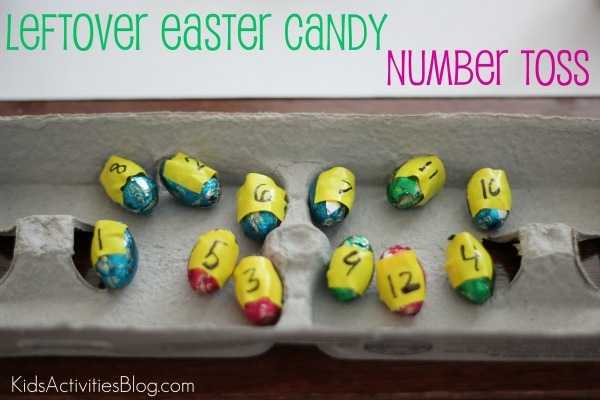 Write two sets of numbers 1-12 on colorful pieces of tape and stick them onto the candy and one into the carton “cups”. Grab another candy and toss it and keep going until all the sections of the egg container are filled! Dump them out and start all over again! 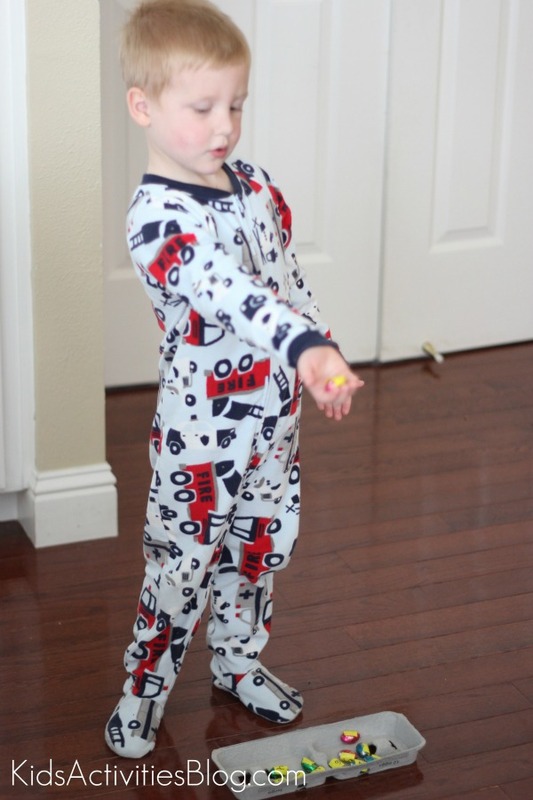 Not only did this game help us practice number recognition, matching, and work on hand-eye coordination skills, it also was a fun and active way to get use out of ALL the Easter candy we have lying around our house! Do you have an older child? Have them toss answer math questions by tossing the candy into the correct answer (ex: 15+19=??? or what is 12 divided by 3???). This game is easy to adapt to a wide range of ages. Like this math game? Check out our other early math activities. Do you have any other fun ways that you re-use candy at your house? What else have you made from an egg carton? Kristina is a mom of two (a preschooler and a toddler) and a former Special Education teacher for children with communication disabilities. She writes about her creative explorations over at Toddler Approved. Her goal is to find ways to make life a little more fun and creative with her kids while embedding learning into everything that she does. Kristina tweets as @ToddlerApproved and can be found on FB and Pinterest. What a wonderful way to work on numbers! What a fun and educational way to use egg cartons! We used our egg cartons for math too! Super fun idea! We have more cartons lying around ….! We did a similar game with Sight Words but I like the numbers on the candy – makes it a bit harder & lots more hand/eye coordination and aiming practice. I love it! We have too much Easter candy and a lot of energy. Time to break out a game– oh, and my boys also love bowling/ tossing games. How cute! I think I wouldn’t be able to resist eating all the mini chocolates though! Noting special to spend more time here, Monte Cristo continues on hand track reckord of the incorrect games.